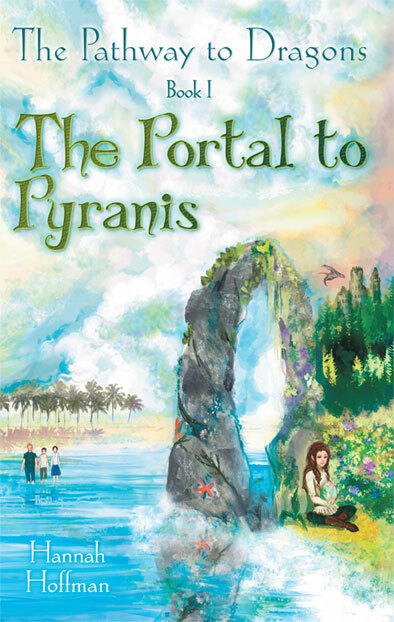 This book is the first in a series of kids fantasy books written by Hannah. Nine-year-old Billy Jones dreams of having a pet dragon! After finding an odd book in the library titled The Pathway to Dragons, he and his two best friends, Maura and Roy, are off for a summer adventure at his Grandma Meg’s beach house. Once there, strange events begin happening, and Billy is reminded that his Grandfather Hugo has been missing for many years. It’s a family mystery. While strolling on the beach, the kids discover an underwater stone arch. They decide to swim through it, and…WHOOSH! They are transported to a fantastical forest, with a view of castle ruins on a distant hill! There, they meet young Talia, and Billy learns that a dragon egg belonging to his family is about to hatch. But beware the dragon hunters! 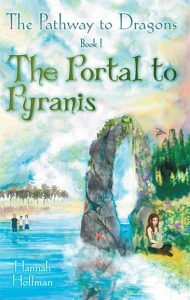 The Pathway to Dragons begins the adventures of Billy, Maura and Roy, in the fantastic world of Pyranis. The story unfolds over ten chapters (72 pages), with an interior illustration helping to set the stage within each chapter. The Pathway to Dragons is available in print and digital format at Amazon, Barnes & Noble and other independent book retailers, and is appropriate for young readers, ages 6 to 13, depending upon their skill level. Hannah is already designing her next installment in the series, and she welcomes communications from her readers.